This recipe makes 2 loaves or 20 rolls. 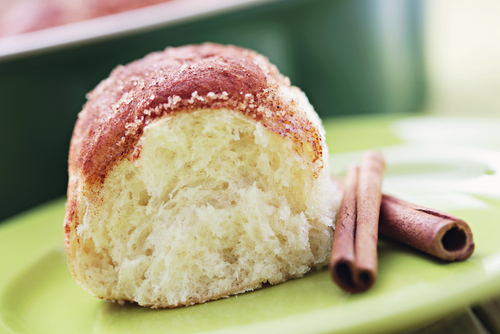 You can also make two round pull apart challahs by batching 10 rolls into a round cake pan. Challah freezes beautifully—you can freeze a loaf whole, or slice it and then freeze it for toast or French toast. Heat: Preheat the oven to 375 degrees Fahrenheit (190 degrees Celsius). Spray the insides of 2 round baking pan. Mix: In the bowl of a stand mixer with the paddle attachment, yeast and water. Let sit for about 5 minutes. Add egg, sugar, oil and mix together. In a separate bowl, mix together Manhattan Blend, baking powder and salt. Add the dry flour mixture into the mixing bowl and mix on medium speed for 3 minutes. The dough should feel soft and slightly sticky, but not like a batter. Add more flour if the dough is too wet. Shape and Proof: Scoop up some dough with a large ice cream scoop and wipe on the side of the bowl to flatten. Release dough 10 dough balls into each of your pre-greased pans. Let sit in a warm and moist area for 45 min-1 hr covered with a warm wet towel to let the dough rise. I like to set my oven to warming mode (about 90-100 degrees F or 40 degrees C.
While the dough is rising, make your cinnamon sugar topping. Mix together melted butter, dark brown sugar, granulated sugar and cinnamon until it becomes a thick liquid. Bake: Pour the cinnamon sugar mixture on top of the challah to coat. Bake the the challah for approximately 35 minutes, or until the color is a golden brown, the outside is crispy, and your kitchen smells like Cinnabun!